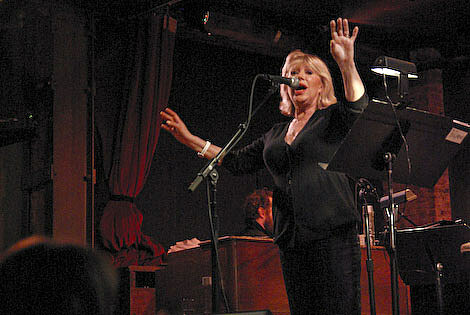 Marianne Faithfull is performing at NYC’s Town Hall on Thursday, September 24th. Tickets ($86 / $51 / $31) go on AmEx presale starting Wednesday, April 15th at 11 AM. General sale begins Friday, April 17th at noon. We also have a pair of front row tickets to giveaway. Details on how to with them below. For the show, Faithfull will be accompanied by a band consisting of Greg Cohen, Marc Ribot, Rob Burger, Joey Baron, Ryan Scott, Christina Courtin, Christopher Hoffman, Lenny Pickett and Marty Elrich. Much, if not all, of that cast contribute to her new album and/or were spotted playing with Faithfull at her City Winery gigs, and on Letterman, in late March. Marc Ribot, who definitely played at the City Winery shows and on Letterman, has his own week of shows planned for early May, to celebrate his 55th birthday. Faithfull’s newest disc Easy Come, Easy Go, which consists of 12 covers from Neko Case to Billie Holiday, is out now on Decca Records. Faithfull was recently interviewed by the newly married Ryan Adams. Marianne Faithfull: And I’ll be doing a couple of gigs with the original band on the record. I’m sure you know all those guys as well.